This chart summarizes the impact of different drivers of warming and/or cooling, by showing the total cumulative energy added to the earth system since 1970 from each driver. Note that the chart is in zettajoules (1021J). For comparison, one zettajoule is about the energy that would be released from 200 million bombs of the size of the one dropped on Hiroshima. The world’s total annual global energy consumption is about 0.5 zettajoule. This entry was posted on Wednesday, April 9th, 2014 at 10:59 am and is filed under climate. You can follow any responses to this entry through the RSS 2.0 feed. You can leave a response, or trackback from your own site. 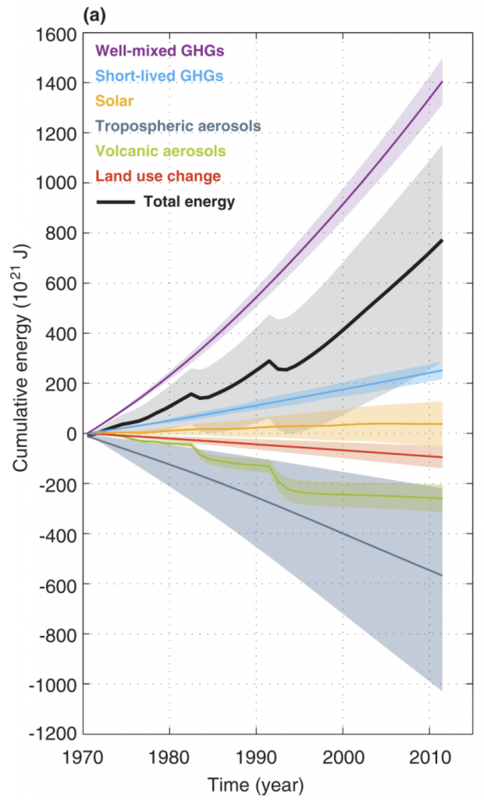 This chart [Box 13.1 fig 1] summarizes the impact of different drivers of warming and/or cooling, by showing the total cumulative energy added to the earth system since 1970 from each driver. Dear Steve, if I were you, before disseminating nonsense to a wide audience, I’d perform at least some sanity check. According to Box 13.1 fig 1(a) current rate of energy accumulation in the climate system (Total energy) is 31 ZJ/year, which can be anything between 18 ZJ/year and 41 ZJ/year due to uncertainties, mostly in Tropospheric aerosols. On the other hand we have data for heat contet of the upper 2000 m of oceans since the beginning of 2005 from NOAA NODC OCL. During the past 8 years rate of heat accumulation in this particular heat reservoir was less than 8 ZJ/year. This is based on actual measurements collected by the ARGO network. Trouble is there’s no heat reservoir in the climate system other than the upper ocean which could store the difference, neither have tropospheric temperatures increased during the last one and a half decade (a.k.a. “pause”), making temperature induced increase in radiative losses to space impossible. Therefore the IPCC has 23 ZJ/year (something between 10-33 ZJ/year) on its hands, which has nowhere to go. That’s huge. I’m sorry, but this is the sort of rudeness I don’t allow here. The issue you raise is important, well-known and worth discussing; the problem is that you’re treating this as the start of a fight rather than a friendly conversation. Further comments of this nature (or comments on my moderation policies) will be deleted. Let’s just enjoy discussing the science! You were once the victim of rudeness here, for which I apologize, so you should know how unpleasant it is. Well, there’s the deep ocean! • Magdalena A. Balmaseda, Kevin E. Trenberth and Erland Källén, Distinctive climate signals in reanalysis of global ocean heat content, Geophys. Res. Lett. 40 (2013) 1-6.
based reanalysis of the ocean. Volcanic eruptions and El Niño events are identified as sharp cooling events punctuating a long-term ocean warming trend, while heating continues during the recent upper-ocean-warming hiatus, but the heat is absorbed in the deeper ocean. In the last decade, about 30% of the warming has occurred below 700 m, contributing significantly to an acceleration of the warming trend. The warming below 700 m remains even when the Argo observing system is withdrawn although the trends are reduced. Sensitivity experiments illustrate that surface wind variability is largely responsible for the changing ocean heat vertical distribution. • Norman G. Loeb,	John M. Lyman, Gregory C. Johnson, Richard P. Allan, David R. Doelling, Takmeng Wong, Brian J. Soden and Graeme L. Stephens, Observed changes in top-of-the-atmosphere radiation and upper-ocean heating consistent within uncertainty, Nature Geoscience 5 (2012), 110–113. Global climate change results from a small yet persistent imbalance between the amount of sunlight absorbed by Earth and the thermal radiation emitted back to space1. An apparent inconsistency has been diagnosed between interannual variations in the net radiation imbalance inferred from satellite measurements and upper-ocean heating rate from in situ measurements, and this inconsistency has been interpreted as ‘missing energy’ in the system. Here we present a revised analysis of net radiation at the top of the atmosphere from satellite data, and we estimate ocean heat content, based on three independent sources. We find that the difference between the heat balance at the top of the atmosphere and upper-ocean heat content change is not statistically significant when accounting for observational uncertainties in ocean measurements, given transitions in instrumentation and sampling. Furthermore, variability in Earth’s energy imbalance relating to El Niño-Southern Oscillation is found to be consistent within observational uncertainties among the satellite measurements, a reanalysis model simulation and one of the ocean heat content records. We combine satellite data with ocean measurements to depths of 1,800 m, and show that between January 2001 and December 2010, Earth has been steadily accumulating energy at a rate of 0.50±0.43 Wm−2 (uncertainties at the 90% confidence level). We conclude that energy storage is continuing to increase in the sub-surface ocean. • Trenberth can’t account for the lack of warming, Skeptical Science. Why did you choose this graph of just inputs? What is (relative to 1860–1879)? All the components start at zero in 1970, does the “relative” information just apply to the last aerosol component? If it is all components, and what is being accumulated is the amount of those forcings to the extent they are different from that 19th century range, then the slopes might be quite steep, even if there is no change in forcing since 1970. Changes since 1970 would only be represented in changes in the slope. 40 years is not really long enough to be climatic, since multidecadal ocean modes like the PDO have are about 60 years. I chose to use this graph because it’s an excellent way of visualizing the relative magnitudes of different forcings in the recent past. It doesn’t show “just inputs”, it shows accumulation. Confusion between inputs and accumulation is common in discussion about climate change, which is unfortunate, because it’s accumulation of energy that really matters in terms of impacts on humans. You imply the graph might be misleading, because you can’t easily see whether there are changes in forcings since 1970. If you want to see that, sure, use a different chart. But the key point of this chart is that even if the forcings were constant since 1970 (and they most definitely weren’t!! ), it doesn’t matter much, because heat still accumulates in the earth system, and will continue to do so until the planet reaches a new thermal equilibrium. The actual level of any forcing at any moment in time doesn’t really affect us. The accumulation of heat energy over time in response to a changed forcing does. BTW I also like how this graph puts into context many things that contrarians like to suggest are more important than greenhouse gases. For example, the graph clearly shows the impact of changes in solar forcing is tiny compared to the GHG forcings. It also clearly shows that volcanoes do matter (and, contrary to popular opinion, they are taken into account in climate modelling! ), but that each major volcano represents a small step change in the accumulation curve, which is quickly swamped by the long term effect of GHGs. Where is the chart from? It is not the same chart in WG1AR5_SOD_Ch13_All_Final.pdf, and I don’t see any reference to “relative to 1860–1879”. Furthermore the (a) chart in the document, is not the accumulation in the system that gets stored, it is just the cumulative input. It is (b) that gives the destination of that energy, most gets radiated, and about 300 10^21J gets stored in the oceans. Also the reason it actually would be interesting if 1860-1879 is the base period for the forcings, is because that would be an inappropriate base for the solar contribution, it one was trying to attribute heat storage into the ocean. By that time solar forcing was already above that of the Little Ice Age and the Maunder Minumum, glaciers were retreating, etc. So there were several centuries of heat storage in the deep ocean to come before equilibrium with this higher level of solar forcing. Of course solar forcing continued to rise until it plateaued at a high level in the middle of the century.